A couple of things here. First, I think that Winslow Homer is an amazing painter, especially in watercolor. Second, I think that copying the work of a master forces one to study what is in front of you – how was this done? what technique? I printed out a copy of this painting on my not-too-high-end color printer. In the end, I referred to it more for composition rather than colors or detail. This image shows the sky with blues in it, but other images on the web gave the sky reddish and yellowish undertones. In the end, I just did what I wanted. The water could have been more turquoise, as is the water in the Caribbean; the foreground in Homer’s painting is some weird vegetation that I couldn’t figure out, but think it is typical for the scrub of the islands. If you look at Homer’s painting, there is a reddish blob by the lighthouse – what is it? Looking closely, you can see it is a flag. For me, it was a big distraction, so I left it out. Also, Homer’s rendition of the lighthouse is very simple – I decided to give it a bit more detail. Copying this painting was a lot of fun. The sea was rather meh, but Homer’s is not especially spectacular. His palm trees, though, are divine. Since I live where there are palms, I really liked the idea of actually attempting to paint a tree – or trees – that are rather intimidating. Homer’s painting catches them snapping in the trade winds – you can just hear them clacking their fronds against each other. I hope that my fronds convey the same sense of sound and movement. 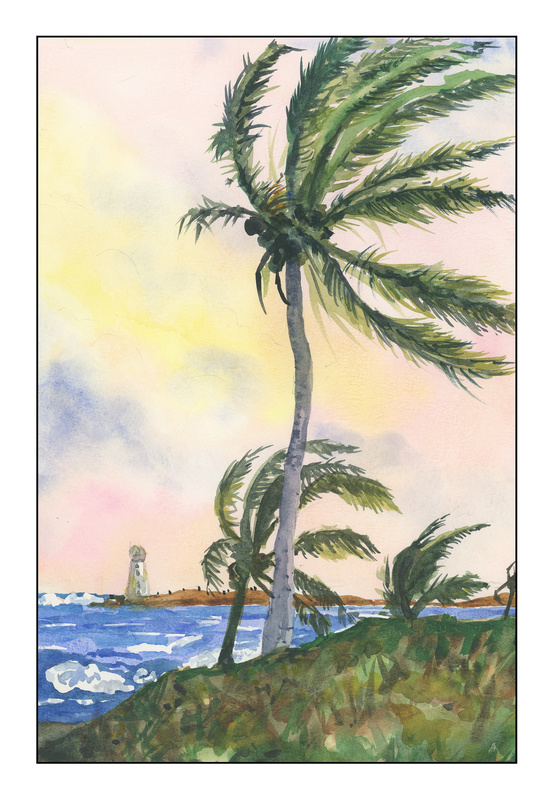 Techniques used in this painting were wet-in-wet for the sky, light washes moving into darker ones for the foreground, and layers of colors for the palm fronds and coconuts. I took some long looks at what was in the painting before me and felt confident enough to figure out what I think Homer did. For the white of the waves and lighthouse, I cheated and used frisket. Then, after it was dried, I laid in the sky, and then moved to other areas, working lighter to dark, some detail to final details, depending on what was going on. Altogether, I spent about 3 hours doing this study. I like both – Homer’s conveys solitude, yours warmth. The difference seems to stem from different palettes, and choices regarding the lighthouse and the flags seem to go along with them. Coming from where palm trees are rare, to me the image of palm trees evoked empty, generic luxury honeymoons. That was until I saw ones in person in Puerto Rico. In windy days as in your painting, I learned that they can exude energy that is so raw and powerful. Thanks, Yul. Homer’s is rather solitary in feeling, partly because it is darker. The paints in the 1800s are considerably different than ones today, and the colors for some paints were probably more fugitive and prone to color change with time. I’m glad you like both versions – so do I! Palm trees are something you love or hate, it seems, but once you begin to get used to them and see their varieties, you begin to like them for their characteristics. Some palms I can’t stand, and others, such as the coconut palm, to me are so graceful and lovely.